Weaving with heavy yarn and using a shuttle with a standard four-inch bobbin or a paper quill means winding lots of bobbins and constantly emptying the shuttle while weaving. Large capacity shuttles to the rescue! This project, currently on one of the looms in our studio, is weaving up quickly using our conventional boat shuttles for 6-inch bobbins.They hold a lot of worsted weight yarn. 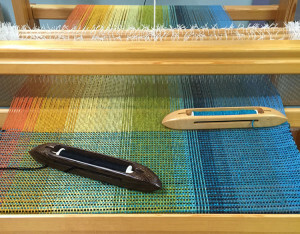 In beginning weaving classes at our retail store, Blue Flag Handweaving, students warp and weave scarves using Harrisville Design’s Highland. After every class there are leftover, partially used skeins and cones. These leftovers pile up and eventually something needs to be done with them. 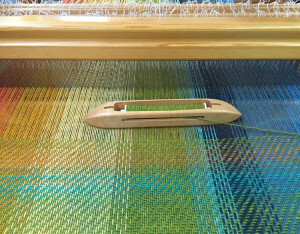 So, the Glimakra Standard loom was warped for two large shawls using eight colors of Highland sett at eight ends per inch. 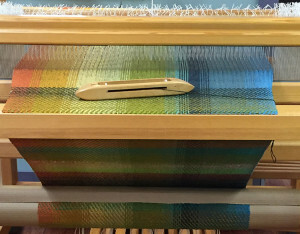 Each color for the six-yard warp was wound on the warping frame until it ran out, resulting in eight stripes of varied widths. Where colors met in the warp they were staggered for eight threads to make a smoother transition. The weft for the first shawl was one and a half balls of Noro Kureopatora. The long color transitions in the yarn were maintained in the weaving by winding an entire ball of Kureopatora onto eight 6-inch bobbins. The bobbins were placed carefully as each was wound to maintain the color order. Then they were used for weaving, starting with the last bobbin wound. The result is a twill shawl that appears to be plaid. The shawl is big – 32″ wide by 80″ long – but was woven quickly with only 12 bobbin changes. The second shawl is now in progress. It is being woven in plain weave using two shuttles for 6-inch bobbins, thrown alternately. One is filled with black Lana Gatto VIP, a luscious merino and cashmere blend, used doubled; the other carries Noro Silk Garden (45% Mohair, 45% Silk, 10% Wool) in solid aqua blue. This second shawl is over half way finished and has only required two bobbins of black and three of aqua. Having large-capacity boat shuttles when using thick yarn really does speed up the weaving process!